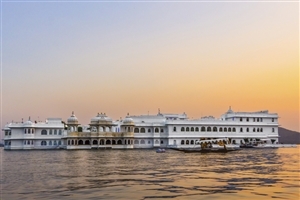 Spend seven nights onboard the luxurious Deccan Odyssey as your travel across India by rail, taking in World Heritage Sites, marvelling at the Taj Mahal, cruising on Lake Pichola and seeking out Tigers in the Ranthambore National Park as part of an action-packed itinerary that will create lifelong memories. Your trip starts in Mumbai, where you board the Deccan Odyssey for eight days exploring India onboard one of its most luxurious trains. After check-in and welcome drinks, you’ll head out of the station to start your journey in the late afternoon with dinner served onboard. Spend the day exploring the area around Aurangabad, with the chance to take in the sights of ancient art and architecture. You’ll visit the impressive Ellora Caves to marvel at the array of shrines that represent Buddhist, Jain and Hindu religions, with the art found within dating back as far as the fifth century. 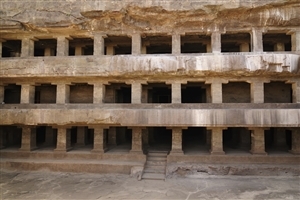 Amongst the caves is the Kailasa Temple, which is regarded as the most famous thanks to its elaborate workmanship and impressive rock-cut architecture. The afternoon will be spent at leisure on return to the train before departing for Jalgaon. 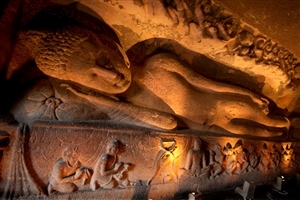 Following breakfast onboard, you’ll head to the Ajanta Caves to marvel at the 30 Buddhist cave monuments that have been carved from the rocks, and which are now seen as masterpieces of Buddhist religious art because of the paintings and sculptures found within. The afternoon will be spent at leisure back on the train. The morning is set aside for a tour of the city of Udaipur, located on the edge of Lake Pichola and one of the most scenic cities to be visited on your trip. You’ll pay a visit to the famous City Palace complex and museum before lunch back at the train. Water levels permitting, you’ll take a cruise on Lake Pichola in the afternoon and visit the Jag Mandir Palace, which is located on an island at the southern end of the lake. Dinner will be served this evening at a city hotel. A day to get close to nature will see you visit the Ranthambore National Park, which is one of the Project Tiger reserves and one of the best places where you can hope to see the majestic predators in their natural environment. During safari trips, you’ll also hope to see a wide selection of other species, including wild boar, antelope and gazelles, before the day ends with high tea at the Sawai Madhopur Lodge; once the hunting lodge for the Royal Family of Jaipur. Enjoy a day exploring the Pink City of Jaipur and its surroundings, starting with a trip to the famous Amber Fort; which sits on a hill overlooking Maota Lake. After exploring the myriad of courtyards and halls, you’ll enjoy lunch at a city hotel before spending time in Jaipur itself, with the highlight being time at the huge City Palace complex. You’ll also be able to spend time in the bustling local markets before departing. 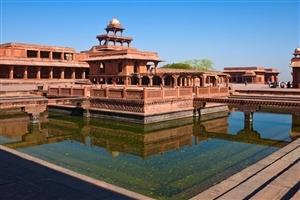 Your penultimate day starts with a trip the abandoned city of Fatehphur Sikri, which was build in the 16th century before a lack of water led to the inhabitants being forced to move elsewhere. What remains is regarded as one of the best examples of architecture from the period. 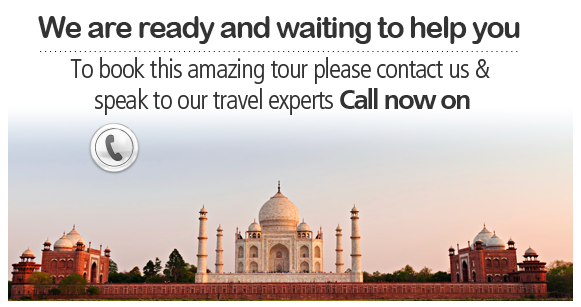 Following lunch in a local hotel, you’ll then head by road for Agra to visit the Taj Mahal, India’s most iconic landmark. A visit to the Agra Fort concludes the day before you head back to the Deccan Odyssey for the final leg of your journey. Following breakfast onboard, you’ll arrive in the Indian capital Delhi where your time on the train will come to an end.